Whether your early-riser is a wee babe or a great big toddler, one thing is certain: early waking is rough! The timing of your baby or toddler’s morning wake-up sets the tone for the rest of the day, AND it sets the pace for the day’s sleep and feeding schedule. That means a way-too-early wake-up call can wreak havoc on what could have otherwise been a perfectly fine day. Clearly, early rising is a problem that needs fixing! What Is “Waking Up Too Early”, Anyway? Now, remember that ‘early’ is a relative term – for some parents, a 5:00 wake-up time is ideal, while for others, anything before 8:30 is considered “way too early!” That’s why it’s a good idea to establish an objective “waking too early” standard against which you can judge your situation. As a rule of thumb, if your child’s wake-up time is after 6 a.m. and he or she is waking up fairly happy and refreshed, then you likely don’t have an early waking problem on your hands. Take a good, hard look at your child’s wake-up time – is it after 6 a.m.? Also, think about how your child wakes up – is she happy and energized? If your child is waking at or after 6 a.m. and seems refreshed and ready to tackle the day, then (as much as it may pain you to hear this!) you probably don’t have an early rising problem. A wake-up time of 6:00 or later is reasonable and developmentally appropriate for most babies and toddlers, provided they are getting adequate nighttime and nap time sleep. Occasional early waking can be caused by a variety of factors, including…. Honestly, occasional and intermittent early waking is nothing to worry much about; if you can trace the cause to something temporary, then simply work on getting back on track as soon as you can. Nap Timing: It may be that either the timing of your child’s naps are off, or the length of the naps themselves is off. If your child’s nap schedule builds in too much awake-time during the day, for instance, then your child may be overtired at bedtime and is more likely to sleep poorly and wake too early. What’s more, if your child’s naps are too short, then that can also cause overtiredness. Bedtime Timing: Contrary to what you might guess, keeping a baby up late at bedtime will not mean a later morning wake-up time! Sleep begets sleep, so a baby who goes to bed early is more likely to sleep well and wake at a decent hour. That said, though, older toddlers who still take an afternoon nap may actually benefit from a later bedtime. If you put a toddler to bed early, he may not be tired enough for sleep and may instead bounce around his bed for hours before he finally falls asleep. 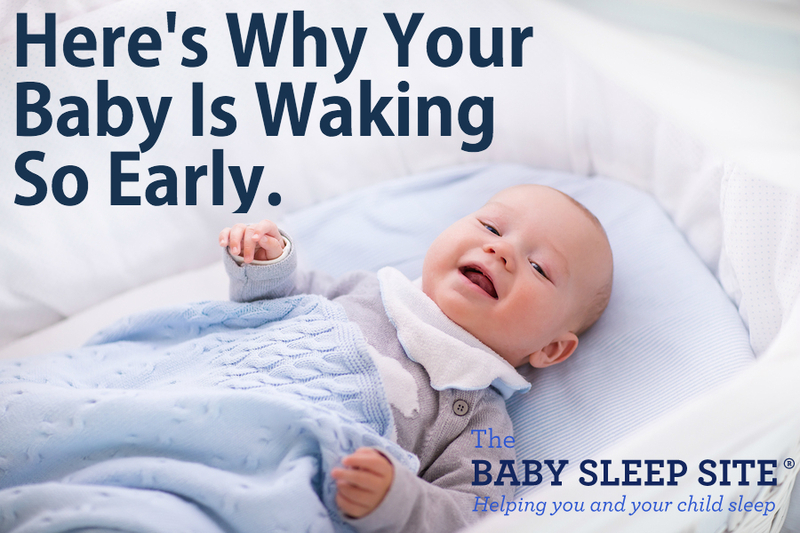 So your baby is waking too early. At this point, you probably know what’s causing the early waking….but how are you supposed to fix it? Good question! First, you’ll want to start treating your child’s early-morning wake-up calls as night wakings, and not “start-of-the-morning” wakings. That means that while it’s fine to get up and offer your baby comfort and reassurance, try not to get your baby up for the day. If you do, you’re merely reinforcing that this early-morning waking is fine and normal and part of the regular routine. Do this for a week or so, and your problem may solve itself. If, after a week of treating early wakings as night wakings, your child is still waking too early, then begin making schedule adjustments. Do you need to work in an extra nap during the day? Do you need to shift the timing of any naps, so that your child has less awake time during the day? Do you need to move bedtime earlier, or possibly later? Do you need to move feedings so that they happen closer to naps and bedtime? Do you need to offer a bedtime snack? Gradually make these schedule adjustments, while still treating any early wakings as night wakings. For more early-waking help, check out our members-only e-book, Shift Your Child’s Schedule. It includes helpful tips designed to shift your child’s schedule either forward or backward so as to fix early- or late-waking problems. Members enjoy unlimited access to this e-book at no additional cost. Early waking can be a tough habit to break. Fortunately, we can help! Connect with one of our expert consultants today; she’ll craft a Personalized Sleep Plan™ just for your baby, walk you through every step of sleep coaching and schedule-making, and provide detailed answers to your most pressing sleep training questions. Or, join our Members Area packed with exclusive content and resources: e-Books, assessments, detailed case studies, expert advice, peer support, and more. It usually costs less to join than buying products separately! And don’t forget that, as a member, you’ll also enjoy a weekly chat with an expert sleep consultant, which is perfect if you have truly tough, pressing sleep coaching questions that require expert help. And the best part – members receive 20% off all sleep consultation services! Is your baby waking up too early? Please share your story or tips below! Hi I am unsure what to do about my sons early wakings. I don’t think he wants to start his day, it is more like a night waking around 4:30/5:30. He cries a lot and seems so tired. When he was around 1 we used controlled crying to extend his nights and he would sleep from about 6:00/6:30-4:30/5:30 then I would feed him and he would sleep until around 6:30/7:00. We just did a reset for him (now 14 month old) to get him to sleep longer at night after being sick and travelling (waking 2-4x with feeding) He goes down around 6:30 and his night wakings have basically gone away. However, he has still been waking around 4:30-5:30 crying and not returning to sleep. We have been leaving him until 6:00 where I then go in a feed him. Sometimes we start our day at 6:00 but if he seems super tired and has been crying for 1.5hr I am putting him back down where he sleeps until 7/8. His naps have always been a struggle. Mornings are usually good with a nap around 9:30 for about 1 hr. Afternoons I almost always need to do a stroller nap and they are around 45 min. He usually goes to bed around 6:00/6:30. I am not sure if he is truly hungry in those early hours or if I should be forcing him to wait until 6:00? Should I then always start the day or should I put him back down? Hi @Amanda – Thank you for writing, and I’m sorry that sleep is not going smoothly! Those early morning wake ups can be tough to solve and can feel brutal! It sounds like you are working hard to teach your son good sleep habits. Sleep problems are quite common at this age, and being sick and traveling can disrupt even the best sleepers! We can definitely help with this issue, and if things do not smooth out, and you would like additional help with this, I do believe you could benefit from one of our Sleep Consultation packages, where one of our experts can take an in depth look at everything in your son’s sleep history and schedules, and she will work with you on a detailed plan that you can commit to and feel good about. Hang in there Amanda, and let us know if you have any questions! My 18 month old wakes between 4:45-5:30 everyday. It’s been happening for around 2 months now. I let her cry it out for awhile but she shares a room with her 3 year old sister. I feel stuck in my schedule since I stay home with both children and moving around the little one’s sleep times impacts the older one. Her bedtime is 7:30 (older sleeps at 8) and nap is from 12:30-3:30ish. Any blaring issues that you see that may cause the early wake time? She’s otherwise a great sleeper. Although she usually wakes up upset. Any help is appreciated. Good luck Gina, and please contact us if things do not smooth out and you would like more assistance! I appreciate this article, but unfortunately it doesn’t help my 3rd baby who is 10.5mo old. We’re giving him 2 good naps during the day (1hr-2.5hr each) and an “earlier” bedtime at 7pm and he still is waking at 5am everyday. We try to have at least a 2-3hr gap between last nap and bedtime. He wakes at least once a night when waking at 5am (usually close to 1am) but sometimes it’s every 2hrs for no reason. Since we have two other kids we can’t let him scream at night so we feed him to basically shut him up and help him fall asleep faster. We’ve tried stopping night feedings and he screams bloody murder and takes hours and hours to fall asleep (plus wakes others up). He’s never slept through the night since birth. My thoughts are since he should be getting around 14hrs of sleep and we want more night sleep than daytime sleep, to decrease nap lengths during the day to be a max of 2hrs total so he can focus on 12hrs at night. I’m at a loss though, because this article says the opposite of that yet it’s not working for us now. Your situation is exactly the type where a consultant can offer a lot of support, and help you decide what order to work on sleep issues, make sure the schedule is solid, and make adjustments to the plan as you go. My baby is going to be 8months next week, still having 2-3naps a day, going bed 18.30-19.00 each night wakes up few times at night for dummy and once to eat, dot at 5am awake for a day, how to extend it till 6am? If you find you are still struggling with the early wake ups, let us know! We have several other resources that may help. Please feel free to contact us directly anytime at contact@babysleepsite.com and we can help you more from there. Hang in there! My 6 month old normally wakes for the day around 7am. However in the last few weeks he has gradually been moving his wake up time earlier and earlier each morning. He now wakes at around 5:30 or 5:45 and he is quite cranky so I know that he is not ready to be up for the day. He falls asleep consistently each night between 7:30 and 8:00 in his crib by himself. Then he normally sleeps through the night without waking to feed. My dilemma is that I know when he is waking at 5:30 that he is hungry so I don’t want to just let him cry. So what I have been doing is going in and treating it as a night waking – keeping the lights off, feeding him, and putting him right back in his crib. He normally fusses off and on then until 6:45 or 7:00. My question is if he finally falls asleep at 7:00 what am I to do? Since that is his usual wake up time do I go in and get him up for the day? Or do I let him sleep till 7:30? I have been just letting him sleep until whenever he wakes up. The problem is then it throws the whole day’s schedule and routine off. I would like to work on getting him into more of a consistent napping schedule but can’t quite tackle that until I have helped him establish a consistent wake up time. Any advice would be much appreciated. Thanks so much! Getting a schedule in order is not directly one of them, but it is implied in the first point. If you find you need more help and things don’t smooth out soon, especially as you start to get on a nap schedule with him, then let us know and we can definitely help! I’m confident our sleep consultants would be able to work through this with you so you can find the perfect schedule that works for your little guy and family. Due to travel, holidays and daycare colds, my husband and I have developed the ‘bad’ habit of bringing our 14 month old into bed to when she wakes up – she nurses and will fall back asleep. It’s usually around 6/6:30am, but the last few days have been much earlier – about 5. She’s in the process of going down to one nap, seemingly always teething, and is typically a pretty poor napper despite our best efforts. I’d like this to stop! Should I go in and nurse her and then leave her again, or just leave her? (I’d also like to stop nursing but that’s another story.) We’re okay with letting her cry if it will fix this. @Liz – Thank you for reading and for sharing with us. Some form of sleep coaching for your little girl can definitely work to break a sleep association such as co-sleeping (if it’s undesired) or nursing to sleep. “Cry it out” is one that may work if it works for your family. If you’d like a personalized plan of action or more support as you work to help her sleep more independently and wean from night feeding, please consider connecting with one of our sleep consultants here: http://www.babysleepsite.com/about or joining hundreds of other families in our Members Area, which you can read about here: http://www.babysleepsite.com/diy/ Thank you again for commenting – please keep reading!